Beside my recent comparison between e-books and traditional book, I own some e-books along with a huge collection of paper-based books. With books, sharing is commonly used among book-owners or bibliophile. The fact of sharing books usually produces an interesting effect doing cross-fertilization of your knowledge. This is applicable to any kind of books and this opens your mind to new books, authors, ideas or even perspective to your life. Sharing books is a common and legally allowed activity, there are even website to support the sharing of physical books like BookCrossing. With the recent publisher's move to sell (or should I say "to rent") e-books to readers or bibliophile, it looks like the sharing of books is trapped in something difficult or impossible to conceive for any editor or publisher. Even the simple fact of moving your e-Books to one reader to another reader (at the end, just moving your book to another bookshelf) is trapped on an eternal tax of purchasing again and again the e-books. This issue of eternal tax on e-books has been clearly explained in "Kindle Total Cost of Ownership: Calculating the DRM Tax". 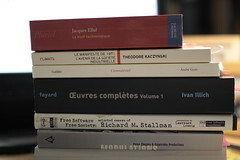 The technology of restriction on e-books introduces many issues and threats against the sharing or access to the knowledge. The restrictive DRM "pseudo-technology" on e-books is the application of the worst nightmare explained in "The Right to Read" written in 1997 by Richard Stallman and published in Communications of the ACM (Volume 40, Number 2). I'm wondering what we can do to counter balance this excessive usage of restrictive technology on the books often defined as "the accessible support of knowledge for the human being". To support the phrase "Think Globally, Act Locally" with the recent threats against books sharing, I tried to come with something to help me to share books locally without hassle with friends, books fans or neighbours. I created Forban to share files easily on the local network. The software is a first implementation of the Forban protocols : fully relying on traditional HTTP with a simple UDP protocol for broadcasting and announcing the service on the local network. The protocols are simple in order to help other to implement other free or non-free software to support the protocol and introduce the local file sharing as a default functionality (a kind of default social duty for promoting local sharing). Forban is opportunist and will automatically copy all files (called loot ;-) announced by other Forban on the local network. By the way, Forban used internet protocols but it is not using Internet (a subtle difference but an important one especially regarding law like HADOPI). Happy new year and happy sharing for 2010.